This 1 bedroom, 1.5 bathroom, that sleeps up to 6 people, is the perfect place to "Eat, Drink & Flounder"! The nautical decor with the blues and grays brings the salty air and sandy shore right into your living room. 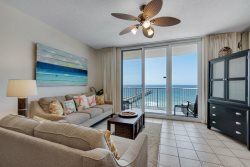 The living room boasts perfect views from the 13th floor of the emerald coast from the gulf front balcony. Let all your woes slip away in the Master bedroom that features a king bed, perfect for a little quiet time. With a queen sofa sleeper in the living room and twin bunks built into an alcove in the hallway you can even bring the family along. Enjoy a fully stocked kitchen and a washer and dryer. Drop anchor and "Eat, Drink & Flounder" with us here on beautiful Navarre Beach. Working with the staff was super easy! This was our 3rd time staying with Navarre Properties and as usual it did not disappoint us. Check in and out is so easy and staff was so helpful! We love this property! It is in the perfect location! This was our favorite condo so far. Being on the 13th floor was great and the condo was super clean and perfect for our family of 5. It was not overly decorated which was perfect for us because we have a toddler who likes to get into everything. We were able to let him walk around freely and know there was nothing to get into! We have visited this complex before and this has been the best staff we have interacted with! We love the location of Summerwind condos. The team members were very friendly, professional, and responsive to any and all questions and needs, both by phone and in person. Enjoyed how accessible they were (since we were in the same building)! This was our first Florida stay and it was everything we had hoped for! Great property, beautiful location! The property was great. We felt comfortable as soon as we arrived and during the whole stay. The staff and facilities made it feel like we were visiting family, not some museum, amusement park or showcase home. Staff were available if needed, but never intrusive. The whole community of Navarre felt very welcoming as well. Overall it was a great experience with a real family friendly atmosphere. After driving down to Destin and Miramar one night I was so glad we picked Navarre and Summerwind. Friendly staff and ready to help answer questions! Beautiful views, well maintained, clean and friendly staff! We look forward to staying again in the future! The members we dealt with were very friendly and helpful. Unfortunately Mother Nature was not on our side for our stay. We just experienced rainy weather the entire time. The location and the place were great. Sometimes the inevitable just happens but the property can't be at fault. Check in is between 3PM and 5PM Central. Rooms are guaranteed by 5PM. Please be sure to have alternate plans in case you arrive before your unit is ready. 25% of the total balance is due upon booking as a deposit. Remaining balances are due 14 days prior to arrival, and in most cases, will be automatically charged to the credit card on file.